89-0127? Wouldn't have guessed that was possible for the pile of CFRP that sat in the weeds. Theres hope then for the F-22's at Tyndall...? I dare you to find any picture of it taken post-rebuild. The aim of any aircraft system is to improve safety or at least not compromise safety. I suspect suggestions of attempting to quantify inertia may be difficult to achieve and do not address the fundamental issue. The aim is to prevent a stall. A stall is avoided by ensuring there is sufficient air velocity over the wing and the AoA is compatible with that airflow. In principle, there is nothing wrong with the direct approach of AoA transducers. The question is really down to a calculation of how effective and reliable those transducers are taking into account what happens if one of more fail at any given time and the processing of airspeed data. Unreliable airspeed and AoA information must be handled in a way that does not introduce unacceptable risk. Bluntly a perfectly adequate air-frame with adequate airspeed and AoA should not result in the controls system forcing the aircraft into the ground. I do not know whether the fundamentals of the air-frame create an unacceptable risk, but I doubt it. It seems to me that it will be possible to resolve the problems with improved control system design. That may include additional or improved AoA sensors, improved software logic, additional system redundancy, improved pilot notification. The problem is likely to occur close to the ground giving little leeway for a pilot to differentiate from a genuine stall situation or a control anomaly. Cross referencing of engine power, pitch and control surface positions may provide additional assistance in flagging an anomaly with the AoA and airspeed readings. It is already fairly clear at this stage that the MAX systems are not adequate. While the pilots and training may be a factor, they are unlikely to be the primary cause of the problem. The problem is primarily with inadequate control systems. No pilot should be placed in the position of having to avert disaster except on the rarest of occasions. Modern pilots still need to be in tune with the machinery they are using; whether it is software controlled or mechanical. Automation has improved safety in general, but has also introduced a new set of problems that every pilot should have an adequate understanding of. That requires automation to be predictable and as intuitive as possible. Not sure if this has already been mentioned but the New York Times is reporting that the new 'evidence found at the crash site' is the horizontal stabilser jackscrew mechanism in the 'fully' nose down position. Last edited by Speed of Sound; 15th Mar 2019 at 13:58.
what a surprise. What may they discover next? The story you linked to seemed to me to be about a different accident B2. Am I mis-informed? Thanks, Conso. Not the Spirit we were all thinking of, but I am amazed they could rehab a plane after a fire damaged some of the structural components. The trim jackscrew may show a nose down final position, and that's what you would expect if the MCAS kept trimming over 2 degrees every time it activated and you did not trim nose up to get the stab back to a reasonable angle. The 610 folks trimmed almost back to normal each time, but eventually lost it. I ask any MAX drivers here to explain the configuration and flap retraction altitude when taking off from that hot, high density altitude. If ground personnel or other aircrews could see the plane descending and then climbing, it must have been pretty low huh? So is a minimal flap setting the procedure to keep drag down? Believe it or not, in my time flying lites, I only had to do three heavy, really high density altitude takeoffs where runway length was a problem and we had a no sierra abort distance well slower than takeoff speed ( Colorado). "Extended envelope training must include instructor-guided hands on experience of recovery from full stall and stick pusher activation, if equipped". 1) MCAS being classified as effectively being a stick pusher at specific points in the aircraft envelope. 2) The deviations allowed at section (e). Any gap on the plane's surface would reflect radar waves. Really? new physics concept perhaps? Otherwise radar signals would be absorbed and re-radiated by deep space. I think what is meant is the EDGES of gaps? That's a different accident with a different aircraft. Same airport but two years later. The incident resulted from Boeing’s failure to incorporate design requirements to mitigate the most severe effects of an internal short circuit within an APU battery cell and the Federal Aviation Administration’s failure to identify this design deficiency during the type design certification process. The incident resulted from Boeing’s failure to incorporate design requirements to mitigate the most severe effects of an AOA vane failure and the Federal Aviation Administration’s failure to identify this design deficiency during the variant design certification process. Getting close, man, but we woud have to show you many models at the test range to answer all your questions, then we would kill you! HINT: All the edges add up and they are not aligned in certain configurations. Fer chrissakes, we are talking about an RCS measured in hundredths of a square meter!!! Thin a reflection of a small bird. What did Brazil do ? I though I saw it reported on here that Brazil would not accept Boeings Max training over the MCAS. What did they require instead? Was it just training, did they require software changes like the Southwest AoA display? was the post I was referring to since the accident in guam was due to sensors and rain and computers reacting at the wrong time for the wrong reason. On the b2 they cannot use the traditional sensor arrangement which complicates the problem. stealth design of the leading edges also complicated things. nuff said .. The one that crased after takeoff and consumed in the fire in videos in this tread was the 2008 one. Crashed due to moisture in pitot static (ports). The one which was rebuilt was the 2010 one, damaged due to fire starting in the engine compartment during an attemted take off. 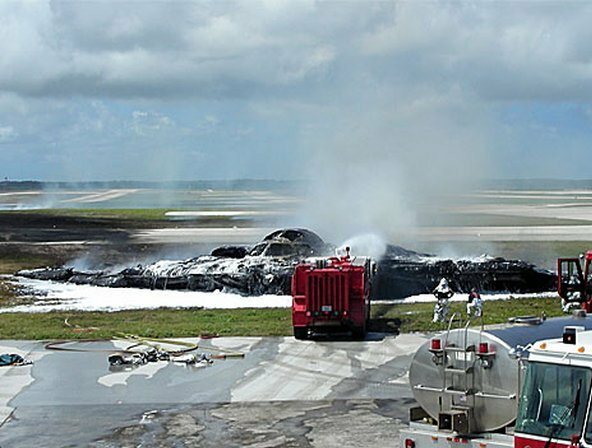 On Feb. 26, 2010, a B-2 attempted to take off from Guam for a routine training mission when a fireball flashed from a left engine, sparking an onboard blaze that eviscerated the interior of the airplane. No one aboard was hurt, but the heat was so intense that it melted and warped parts of the B-2's titanium and aluminum frame. The plane's wiring and hydraulic tubing turned into smoldering ash. Though the damage was bad, the Air Force determined that the plane could be saved. That was good news. A B-2 was completely lost in 2008 after moisture built up in the plane's high-tech sensors and caused it to crash and burn. The pilots safely ejected. The military said it couldn't afford to lose another of these aircraft. The repairs required more than 1,000 parts ranging in size from small clips to massive sections that support the structure of the aircraft. The project took nearly four years at a cost of more than $105 million, which included a scheduled overhaul. The one which was rebuilt was the 2010 one, damaged due to fire starting when one of the engines was starting. Do we know how far from required stall caracteristics the aircraft is without the MCAS? How serious is this deficiency in (pre) stall characteristics? How much redundancy, based on the seriousness of the deficiency, will be required by the revised MCAS? Based on the very old and limited FCC/sensor package/system layout on the 737Max, how much redundancy can feasibly be built into a revised MCAS system? Last edited by SteinarN; 15th Mar 2019 at 19:48. Looks to me that the plane requires less and less back stick and needs help to keep the AoA from increasing. What say you? So tweaking with the "feel system" is nice, but only aerodynamically re-trimming the plane with the stab can satisfy the Part 25 requirements. Huh? P.S. If they are still kicking, say hello to Einar "Smeds" and "Molz" from that first Viper class at Hill. I have read Bjørns posts. My questions was more like rhetorical. I have no knowledge regarding the regulations aircraft have to comply with. But I have a feeling that if Boeing really is to comply with the regulations, I suspect it might be very difficult to fit a MCAS system that have the required redundancy. In fact I cant see how it can have any redundancy at all. Only two AoA sensors give exactly... zero... redundancy. Only two FCC gives exactly.... zero.... redundancy. Or might there be two separate processors in each computer? But still that would require at a bare minimum that all four processors was in the loop at any time. So, if MCAS is a system that is regarded as required for safe flight, and thus might be required to have redundancy, can this be done? At some point in the design phase of the MCAS, the question would have been asked "How many Alpha vanes do we want to feed the active FCC?" Three would be the best use of redundancy. The problem with two is that all you can really do with a two sensor disagree, is disable the system altogether which then leaves the aircraft without a system required for certification. That leaves one sensor which if it fails 'unsafe', leaves the system in operation therefore good for certification but then relies on the crew to 'catch' the problem. This may be overthinking things but that suggests to me that the MCAS decision was made very late in the whole process where adding an extra vane to the nose (or anywhere else) would cause a prohibitively long delay so the use of only one vane was the only option open to the designers at that stage of the game, effectively a fait accompli. There are currently legal cases against Boeing with respect to the Lion Air crash and if that turns out to be down to the MCAS as does ET-302, unless Boeing makes an out of court settlement, the design and testing process will almost certainly have to be revealed to all in open court.